We all want to be happy, right? Although certain events or situations in life do not always result in happiness, it is possible to live a happy life overall. Here are a few Do's and Don'ts that always work if you are looking for and wanting to travel on the path of happiness. -Don't hang around negative people - This is huge. I know sometimes this is hard to avoid if you are at work and have to be around certain people throughout the day. It is easy though to pick who you want to be involved with outside of the work place and even who you spend any spare time with at work. They say that you end up picking up habits and/or traits of the people who you spend the most time with throughout the day. The last thing you want is to start taking on the same views and characteristics of someone who is always negative about everything. -Don't say yes if you don't mean it- If you can't make it to a certain event, you can't carry out a certain favor, whatever it is that you know you are not able to do, do not say yes to doing it. This usually causes lots of issues and even sometimes breaks up relationships with friends and leaves you to seem unreliable. You don't want that. 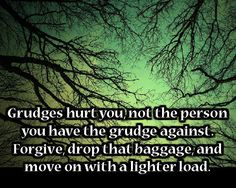 -Don't hold grudges- Its easier said than done, this I know but it only ends up hurting you in the end. Once you let go of your grudge that you are holding on to, it is amazing how much weight you will feel lifted off your shoulders. -Don't live in the past- Living in the past prevents you to live in the present and we don't want that. You want to live for the present and work towards your goals in the future. Learn from the past but don't live their. The past is the past for a reason. 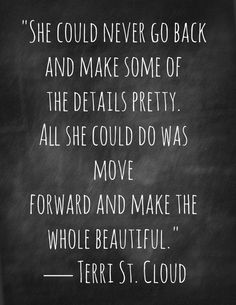 Been there, done that, moving on! -Don't compare your life and accomplishments to others- We are all at different points in our lives and have all chosen different paths. Never compare yourself to others. You don't know what their entire journey was all about, and people will always have a different view of what they consider life accomplishments. There will always be someone out there who is ahead and always someone out there who is behind. Don't worry about them. Focus on you. -Learn from your mistakes- Don't make the same mistakes over and over again and expect different results. We all know what that is called. Learn from your mistakes. We all make them and that is fine, it's part of life. As long as you are able to take something away from it and teach yourself what you could do differently in the future to improve and not make that mistake again, that's what important. -Try again - If at first you don't succeed, try and try again- We all fall in life at one point or another. 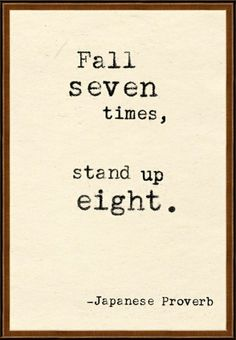 Just get back up and try again. It's all about how you bounce back from the fall that is important, not the fall itself. -Keep in touch with those who matter- People don't talk anymore. It's sad. Whether it's texting, tweeting, facebooking, emailing, stop! Pick up the phone or take a drive out to visit loved ones, ones that have been their for your falls and helped you back up. Those who helped you learn from your mistakes. The ones who saw you in your past and still love you, no matter what! Keep in touch with them, call them, visit them, send them fun snail mail cards just to say hi. These people are the ones who are important in our lives, the ones who hold value in our lives and are the people who give us those happy memories. Don't forget about them. -Wake up every day thinking something positive- Tell yourself something great is going to happen when you wake up. 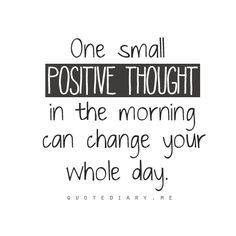 This helps our day unfold in a more positive and productive way. It works! Try it, I dare you. What do's or don'ts do you have for finding happiness? What lessons have you learned? my biggest tip is to choose happiness. it all comes from within. Great tip Elle, that is true! Great post. Awesome tips. We get to choose if we are happy or not! Great tips, lady! I'm a huge advocate of removing negative people from my life. I had to do it recently and it was one of the best things. The drama is gone, the constant complaining is gone and I can be my happy, positive self all the time. I need to get better at letting grudges go, though. I hate when people wrong me or friends and I really just dislike that person because of what they did. Yes, grudges are a big thing for me too because I am very protective over the ones I love as well. work in progress! You couldn't be more correct! Thank you for stopping by! Such a great post!!! If the person doesn't matter they shouldn't be able to affect your mood at all - that's how I look at it!! I love the quote of not comparing - it's so true! Thanks girl! You are so right. That's totally a life lesson that most of us all know as adults. If only we could go back and tell our younger selves that. Very great advice. 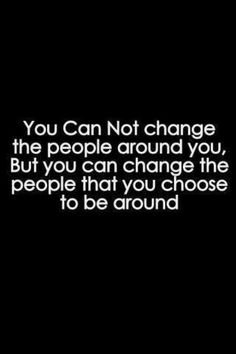 Surrounding yourself with people that are positive and lift you up versus dragging you down is key! 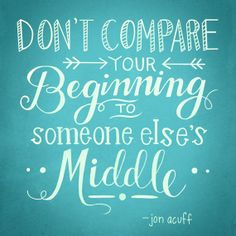 Love the don't compare your beginning to someone else's middle quote! Me too! It's true. Def something to live by.